#5. Yosemite Valley in August. I am not a Yosemite Valley snob. I love the valley and I enjoy spending time there. I got married there! Even I have to admit, though, that a hot, dusty, crowded August weekend is not a time when the valley is on its best behavior. Not only is it hot, dusty, and crowded, no one in the crowd seems to be having a very good time. Mostly I see people who are there because they felt they had to visit while they were in California. They want to check the block and get the heck out. No fun. #4. Groups who have no idea what the rules are. During one thru-hike I camped my first night out of Red’s Meadow near Purple Lake. Once I got my tent set up I decided to walk back down the trail, to the lake, for water. While on the trail, I tripped and nearly fell on my face. My tripping isn’t all that surprising; I’m not known for being particularly graceful. Except that I tripped on a tent rope, staked ACROSS the trail. A group of about a dozen hikers had camped right next to the trail and right next to the lake. Later that night, they had a good sized fire, despite the fact that they were prohibited. I found out later that the group had been earlier fined for camping at the Thousand Island Lake outlet stream. Apparently, no one learned a lesson. Thanks for the kind words, Robin. I bet you can tell some stories about Upper Pines! What is it about Purple Lake? 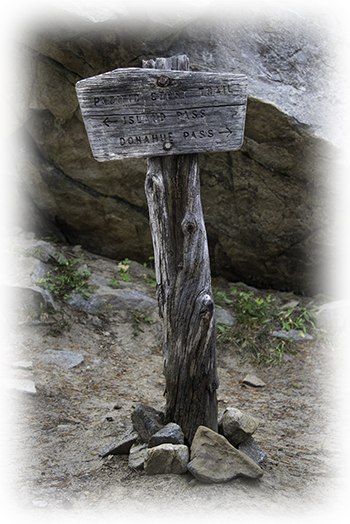 Back in 2011, I had a similar experience there with a tent stake & guyline crossing the trail. I think it must be people arriving after dark and not knowing where they are in relation to the trail – or perhaps they just don’t care. Something in the water, perhaps? Thanks for the comment, Bill. A guylie across the trail? That is insane. I doubt I would be able to keep my mouth shut about that. BTW – I am not a fan of the valley in August either. Basically, the whole summer. Amazing the amount of people who just use camping as an excuse to get drunk, and trails as a reason to talk on their cell phones. All true, Kathy, although I have to admit feeling some anxiety on my last long hike as I disconnected from my devices! Thanks. 4. I know those guys. They ruined an otherwise perfectly mediocre night fro me at the Lyell Bridge, and I reported them for the Thousand Island stunt. Hope I would not hesitate to cut the line. 3. Ditto, but I would say a close second is the bottom third, what I call the Spike Lee Dolly Shot: the faster you descend, the faster the Portal Store recedes into the background. 2. This is why God gave us Tylenol PM, frequent urination, and incredible moonlit cloudy vistas of Valhalla (ok, not JMT, but you get the idea). 1. I don’t what you are talking about. Somebody needs a Mooseburger and a Sierra Nevada, not necessarily in that order. “…Spike Lee Dolly Shot: the faster you descend, the faster the Portal Store recedes into the background.” Actually, the first time I saw that effect was in “Jaws” (with Brodie on the beach; see https://youtu.be/svEPWBxpYjo). You are right about it seeming to recede. Thanks, Peter! I’ve never quite understood why so many people camp at Purple Lake when Virginia Lake is a lot more spacious and has far more proper (LNT) camp sites to choose from. Also, IMO, Virginia Lake is a nicer setting with better views. Perhaps that last climb up is more than a lot of people want to tackle on the first day out of Red’s Meadow but I think it’s worth it. I agree, Ravi, and recommend people go to Virginia, too. Most folks, coming out of Red’s Meadow, will reach Purple Lake by mid afternoon and the extra couple of miles is not that bad — and the rewards are great! I’d have to add finding toilet paper under a rock. Sort of goes along with #4 on your list. Enough said. And I think I’ll pass on Purple Lake this year for camping – we’re going out Duck Pass so we’ll press on to Virginia Lake – more sites, further apart and such a glorious lake! True, Betsy! Lake Virginia is gorgeous in the morning. Thanks! Same here, Betsy: I’ll never camp at Purple: some guy fetching water in the dark is always tripping over my guy ropes. Newbies!! I just finished my JMT hike at the end of September, and that middle stretch coming down from Whitney was the absolute worst part of the trail for me as well. There isn’t a stable or level place to put your foot on that entire stretch – it’s nothing but rocks and granite ledges at odd angles. It was miserable. After the euphoria of a sunrise at the top of Whitney, it was already bad enough to have the seemingly interminable exit from the trail. But to have it be some of the worst trail of the entire trip made it that much worse. Luckily the trail evens out after that middle stretch and you can really cruise for the final third. Not only odd angles, but steps down from high ledges that are hard on the knees. Thanks, Mark! Hi Ray. Really enjoyed your book! I am considering hiking the JMT SOBO leaving Happy Isles around September 5th. Wouldn’t most of the crowds be gone by then with the last big hurrah being Labor Day weekend? Also, would the NPS allow an Ursack in lieu of a bear canister? Thanks! Thanks for the kind words, Dony, and you are absolutely correct. The crowds diminish significantly after Labor Day. URSACKs are not yet approved for food storage by the NPS, but I believe they are working on it. While the huge crowds may be gone, it will still be plenty crowded. I started on Sept 12th this year and the crowds on that weekend were still pretty big. All of the campgrounds were full to capacity and the valley was teeming with cars and crowds. I was happy to get out of the valley and on to the peace of the JMT (which begins the minute you pass the half-dome cutoff).. Crowds during the week should surely be lower after Labor Day, but I wouldn’t expect it to be anything approaching quiet. Also, keep in mind that the permit process is very unpredictable. There is a strong chance that you won’t get your desired date, even during the “lower demand” start period of September. It took me almost 3 weeks of submitting permit applications before I got my Sept. 12 start date. Be prepared to begin submitting applications earlier than your ideal date and be flexible on your start. Thanks for the comment, Mark. You are sure right about a huge change in ambiance once you pass the trail to Half Dome. It’s a whole different experience! Ray – I have had that smell problem in my bear canister. Picked up a great tip from someone on BPL – use automatic dish detergent to soak. Smell comes right out completely and totally. I don’t put it in the machine, obviously, just soak it. Of course, that doesn’t help on the last day of the trip! Seal it tight til you get home. That never occurred to me but sounds like a great idea. Thanks, Karen! All great ideas, Peter. I’ve done the bear-can-as-washing-machine trick a few times myself. Thanks for the comment! As you said, it depends on how the season unfolds. It is way too early to make an educated guess as to what the snow situation will be in July (although you are correct to assume that the chances are good that there will be more than last year). If you assume that there will be significant snow, I would be less worried about footwear and more worried about navigation and snow skills. If you feel you are strong in those areas, it just mean a longer trip (going will be slow) and a heavier pack. If you need to brush up on your winter skills, I would recommend http://mountaineducation.org/. Thanks for the comment, Steve.